عند طلبكم لشرايح لشرايح الفيلية ، فإنكم تطلبون لحم صافي وزنه 1 كج ، و حتى نستخلص هذا اللحم الصافي فأننا نحتاج أكثر من سمكة لنصل الى وزن الكيلو من اللحم الصافي و لهذا يزيد السعر. بعض الأسماك يتواجد بها خيار الفيلية ، تحت صورة المنتج ، و في هذه الحالة بالتأكيد سيكون وزن اللحم المستخلص أقل بكثير من عدد الكيلوات المطلوب بسبب رمي جزء كبير من السمكة كأحشائها و الشوك و غيرة و سيكون السعر اقل كذالك . An order of fillet fish , mean that you order a clear fish meat with net weight of 1 KG , to reach this weight we required more than one fish , that’s why the price bet higher . Below some of fish images u may found fillet option , in this case the net weight of fish meat less than the required KGs , because of unwanted wastage , and the price will be less as well . Popular in worldwide especially in Arab GCC countries , known for their low oiliness and juicy, thick flakes, hamour are worth experimenting with for hearty menu items. They are especially good fried, barbecued or steamed as fillets or steaks. Grilled hamour steaks are excellent served with pepperonata or tapenade. Try baked in a rich vegetable provençale, or salted, for a unique taste. Popular in worldwide especially in Arab GCC countries , known for their low oiliness and juicy, thick flakes, hamour are worth experimenting with for hearty menu items. They are especially good fried, barbecued or steamed as fillets or steaks. Grilled hamour steaks are excellent served with pepperonata or tapenade. Try baked in a rich vegetable provençale, or salted, for a unique taste. A traditional Arab GCC preparation is to flake poached Hamour, mix in rice , deep fry the fritters, and serve with saffron and braised beets Hamour can also provide good flavouring for stocks and soups and are excellent in curries and casseroles. Heads of large individuals are sought after for the cheek flesh, which is used in soups and stocks. Live hamour are popular in some Asian restaurants. They are also superb raw, particularly in a Tahitian salad. Hamour are important food fish, and some of them are now farmed. 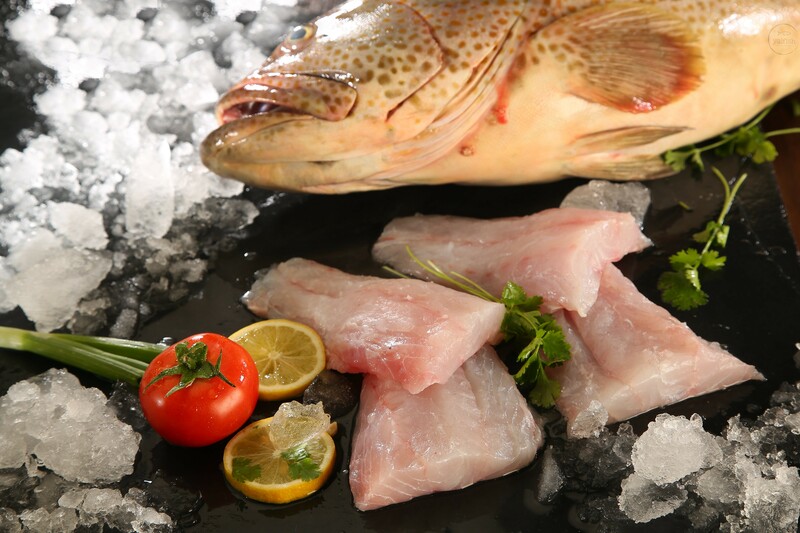 Unlike most other fish species which are chilled or frozen, groupers are usually sold live in markets. Many species are popular fish for sea-angling. Some species are small enough to be kept in aquaria, though even the small species are inclined to grow rapidly.